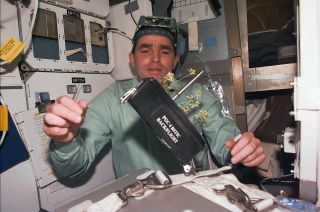 Leonid Kadenyuk, the first astronaut from an independent Ukraine, is seen working with Brassica rapa sprouts aboard the middeck of the space shuttle Columbia during STS-87 in 1997. Leonid Kadenyuk, the first astronaut of an independent Ukraine who flew on the U.S. space shuttle in the late 1990s, has died. Kadenyuk, 67, was on his morning run in a park in Kiev on Jan. 31 when he suffered a heart attack, the State Space Agency of Ukraine said in a statement to the Interfax-Ukraine news agency. "We express our sincere condolences to relatives, friends and colleagues of Leonid Konstantinovich. We share your sorrow and the pain of irreparable loss." the State Space Agency wrote in a statement. Kadenyuk was selected to train as a Soviet cosmonaut in 1976, 15 years before his country gained its independence from the now-former USSR. His first and only spaceflight, though, did not come until after he transferred to Ukraine's space agency to join its first group of astronauts selected from the National Academy of Sciences of Ukraine. In 1996, the State Space Agency of Ukraine (known then as the National Space Agency of Ukraine, or NSAU) and NASA chose Kadenyuk as a candidate payload specialist for the Collaborative Ukrainian Experiment (CUE) slated to fly on board the space shuttle Columbia. One year later, on Nov. 19, 1997, Kadenyuk launched as a member of Columbia's STS-87 crew on the fourth flight of the United States Microgravity Payload (USMP-4). "We had a joint payload called CUE, with the Ukrainians and the American scientists, and it was looking at about 10 different experiments on plant growth," said Kevin Kregel, commander of STS-87, in a post-flight NASA presentation. "We're looking at the effects that microgravity and radiation have on plants and their pollinations because when we go to space for longer lengths of time, we're probably going to have to grow our own plants for food." CUE also had an educational outreach component, which involved evaluating the effects of microgravity on Brassica rapa (Wisconsin Fast Plants) seedlings. As estimated pre-flight, 625,000 American students and teachers in the U.S. and 20,500 Ukrainian students and teachers performed a similar set of plant growth experiments on the ground while Kadenyuk did so in space. "Leonid was a great farmer and kept busy as a bee," said Kregel. The crew, which included pilot Steven Lindsey and mission specialists Winston Scott, Takao Doi of the National Space Development Agency (NASDA; now the Japan Aerospace Exploration Agency, JAXA), and Kalpana Chawla, who six years later was again aboard Columbia when it and her six STS-107 crewmates were lost during reentry, orbited Earth 252 times. Kadenyuk and his STS-87 crewmates logged 15 days, 16 hours and 35 minutes in space. Leonid Kostyantynovych Kadenyuk was born on Jan. 28, 1951, in the Chernivtsi area of Ukraine. He graduated from Chernigov Higher Aviation School 20 years later as a pilot-engineer. After being selected as a cosmonaut, Kadenyuk attended test pilot training at GNIKI VVS USSR, the State Scientific Research Institute of the Russian Air Force. He graduated in 1977, proficient in test piloting, aircraft construction and exploitation. He then underwent a year of basic spaceflight training at the Yuri Gagarin Cosmonaut Training Center in Star City, Russia. As a Test Cosmonaut, he was prepared to conduct research in biology, ecology, medicine, meteorology, space geology and geobotany, both in space and on the ground. From 1978 through 1983, Kadenyuk served in the Multiple Usage Space Systems Group at the Cosmonaut Training Center, undergoing advanced training in the conduct of in-flight scientific experiments. He was also trained in survival techniques and extravehicular activities (spacewalks). If history had played out differently, Kadenyuk would have flown with Russia's space shuttle, rather than NASA's. In 1990, following a Ukrainian-USSR state agreement on a collaborative space program, Kadenyuk was appointed to lead a Ukrainian space crew. For two years, he trained to command a Soyuz spacecraft for a planned docking with the uncrewed shuttle Buran and the Mir space station. NASA portrait of STS-87 payload specialist Leonid Kadenyuk. The mission though, was canceled due to budget shortfalls in the wake of the end of the Soviet Union. Following his flight on space shuttle Columbia, Kadenyuk returned to the Ukraine, serving the State Space Agency and rising to the rank of Major General in the Ukrainian Air Force. In 2002, he was elected to the Verkhovna Rada, the Ukrainian parliament, and worked within its committee on defense and national security. Kadenyuk also served as advisor to the prime minister and head of the State Space Agency. "We are deeply upset by this huge loss. Leonid Kadenyuk was a legend in U.S.-Ukraine space cooperation and today we mourn alongside all of Ukraine," the U.S. Embassy in Ukraine wrote on Twitter. Kadenyuk was married to Vera Kosolapinkova. He had two children, Vladimir and Dmitri, the earlier with his first wife, Lyudmila Kolevatova.